California studio Anacapa Architecture has designed a luxury campground in Sonoma County that features customised tents and Airstream trailers, along with an open-air clubhouse for guest check-in and socialising. The AutoCamp site is located in the scenic Russian River Valley, which is about 90 minutes north of San Francisco. 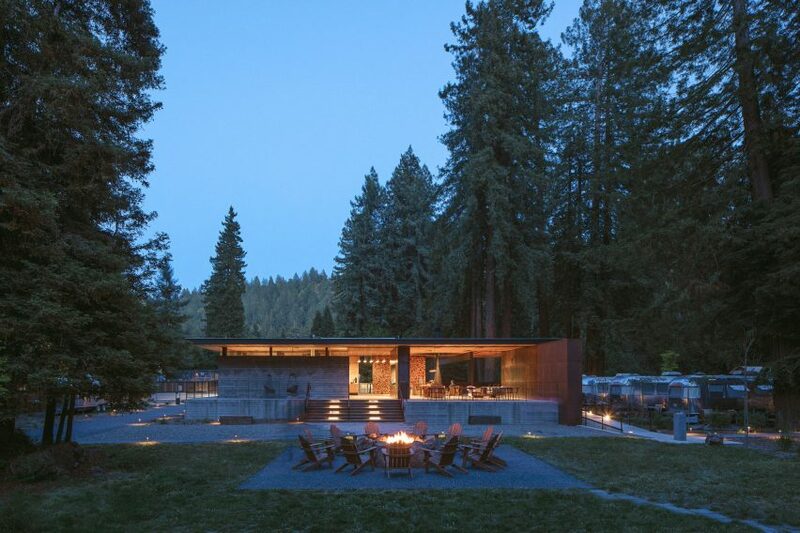 Designed by Santa Barbara-based Anacapa Architecture – with interior decor selected by San Francisco’s Geremia Design – the campground sits within a forested landscape with grassy meadows. The hilly region is also known for its vineyards, which lie to the east. 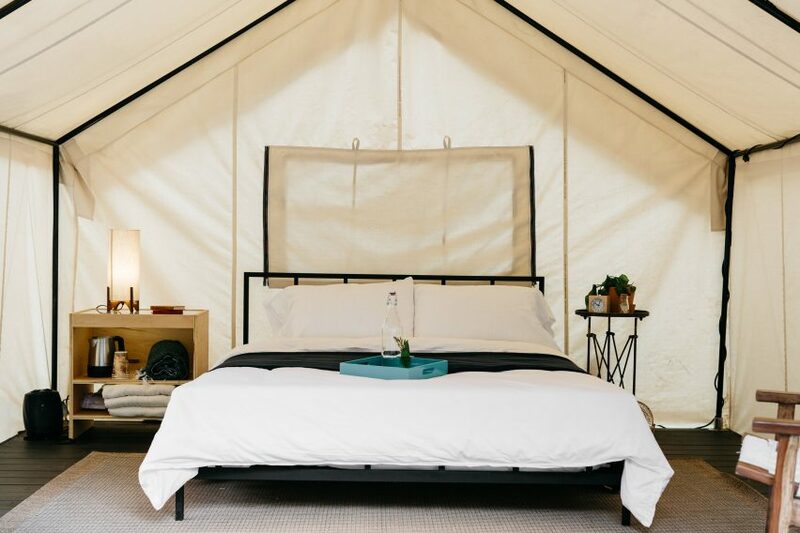 AutoCamp Russian River is one of three glamping sites developed by California real-estate firm Mesa Lane Partners, which aims to fuse the “adventure of camping with beautiful modern design”. The company opened its first AutoCamp in Santa Barbara in 2013, and runs another site near Yosemite National Park. The Russian River site, which opened in the fall of 2016, features 24 customised Airstreams and 10 luxury tents, along with a clubhouse that contains a reception lobby, dining area and gathering spaces. The metal trailers and canvas tents are fitted with high-quality decor, including Casper mattresses, organic throw blankets, comfy bathrobes and stainless steel Coleman coolers. Outside each unit, the team placed a fire pit and grill, where guests can cook up dinner and hang out under the stars. Overlooking a motor court, the open-air clubhouse sits atop a concrete base and is topped with a flat, overhanging roof. 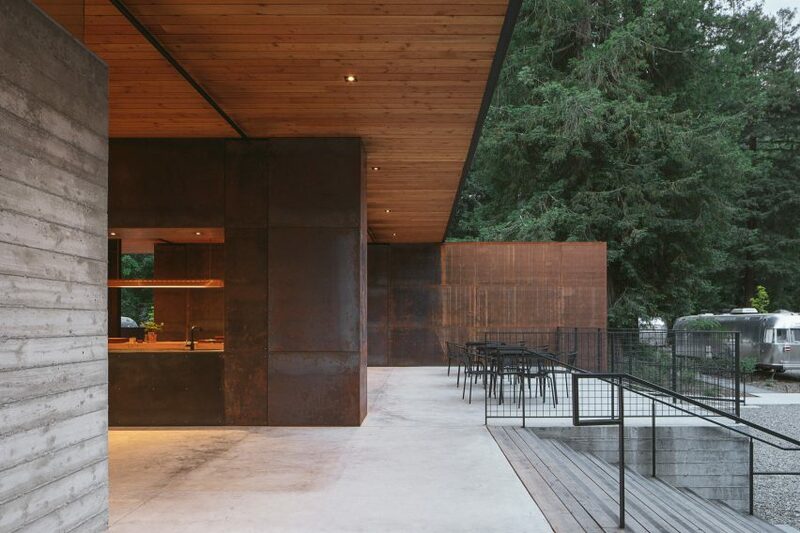 The pavilion’s low-profile contrasts with the extreme verticality of the surrounding redwood trees. 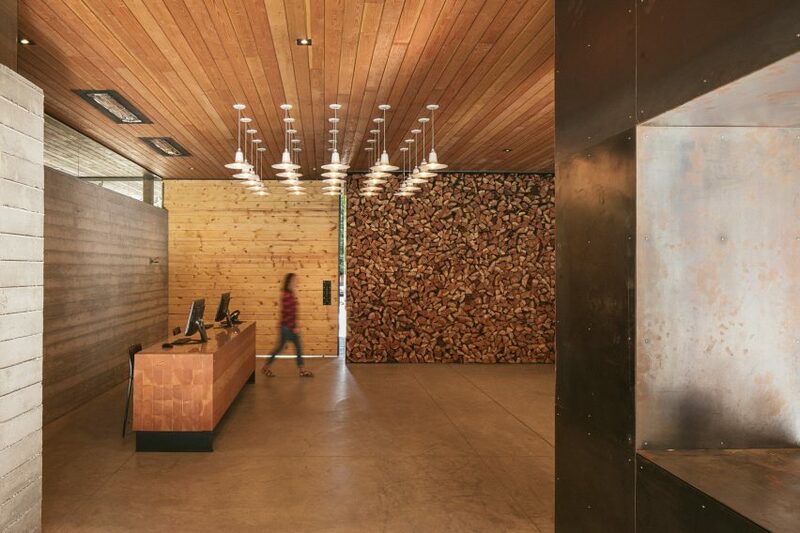 Materials such as rough-sawn cedar, board-formed concrete and blackened steel were chosen for their durability, and are intended to age naturally over time. While envisioning the clubhouse, the design team took cues from two iconic works of architecture. 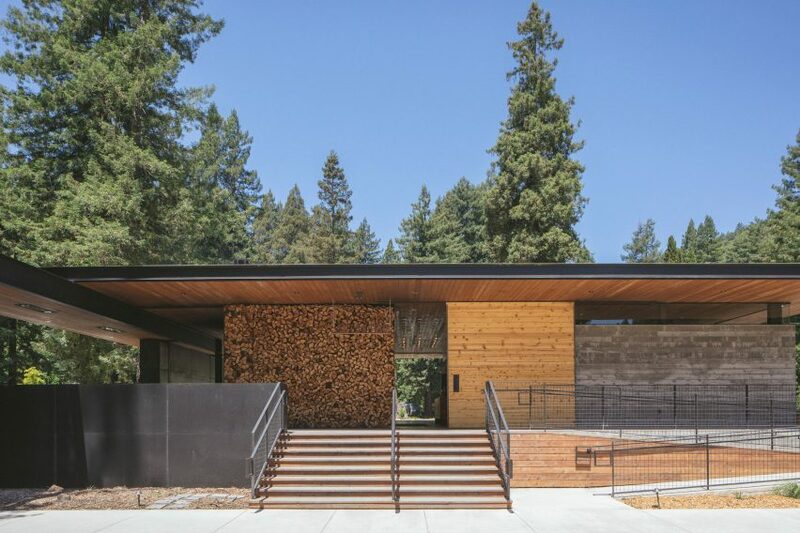 “Drawing inspiration from the iconic Barcelona Pavilion by Mies van der Rohe and the Kaufmann House by Richard Neutra, the Clubhouse is strongly influenced by modern, minimalist design,” the architects said. The interior of the 3,000-square-foot (279 square metres) pavilion features an earthy colour palette and streamlined decor. 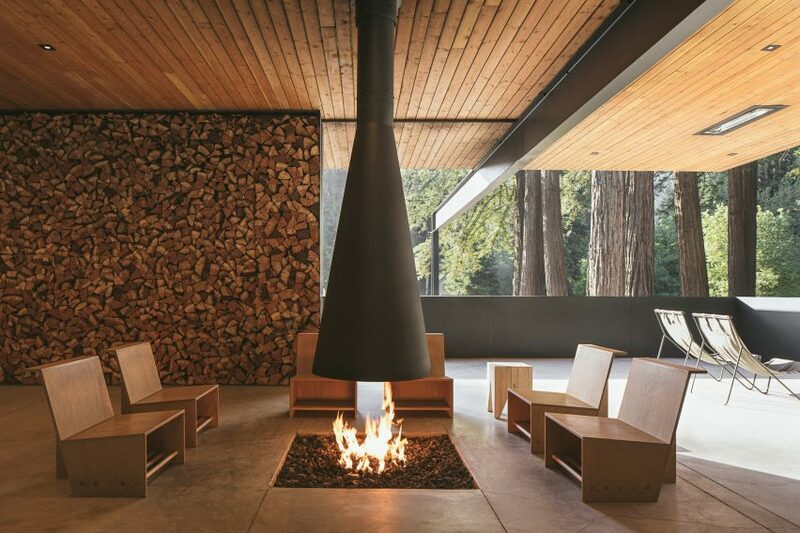 A cordwood wall overlooks a lounge area, where chairs are gathered around a suspended steel fireplace. 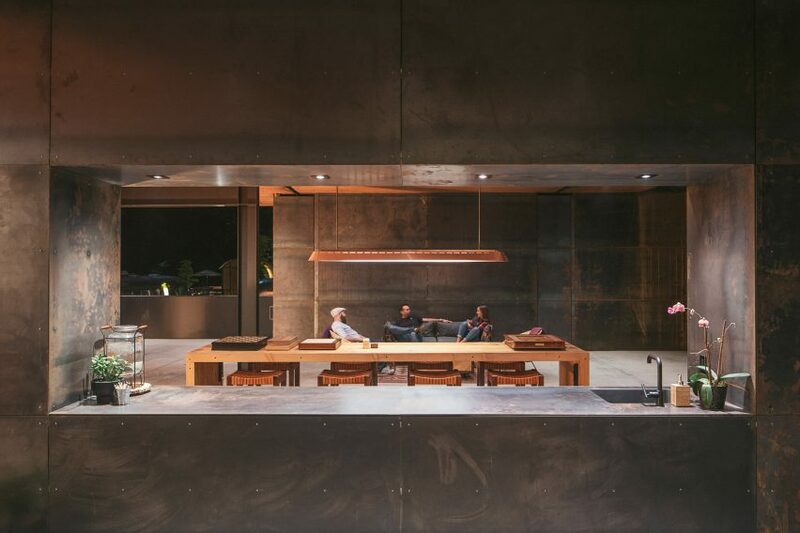 Also visible in this space is a “spider-leg” steel beam – a beam-and-column configuration made famous by Neutra – that is meant to mediate the passage from inside to out. Whether taking shelter inside or enjoying a drink on the patio, guests are meant to feel a strong connection to the wilderness throughout the pavilion. 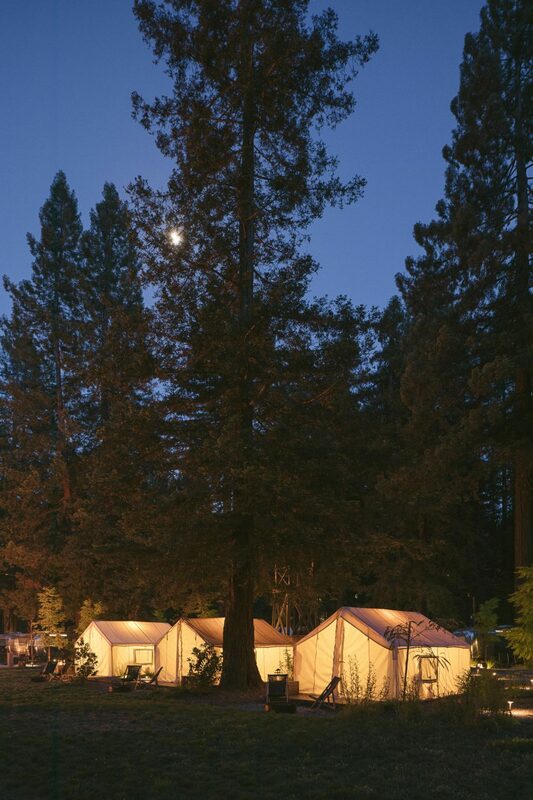 Luxury camping accommodations have become increasingly popular in recent years. Other projects include the SJCC Glamping Resort in South Korea by Atelier Change, which features a collection of brightly coloured tents, and the rentable Getaway micro cabins, which are geared toward stressed-out city dwellers on the US East Coast.